Tasks for R FOSSEE Summer Fellowship 2019: To participate in FOSSEE Summer Fellowship 2019 in R two tasks need to be done. Task A is “Textbook companion (TBC)” in which we have to choose a mathematical book for which R coding of solved examples can be done. The probability and Statistics has always been among my favorite area of interests so I choose the book “Probability, Random Variables and Stochastic Processes by Athanasios Papoulis and S. Unnikrishna Pillai” as my book for TBC. I submitted the proposal along with 5 sample codes from the same book and it was approved within a day. After approval, I starting writing codes for rest of the solved examples from the book. While coding, it was little challenging at the beginning as I was doing it for the first time. But as I progressed, it became easier. While coding not only I enjoyed mathematics as it is my area of interest but also learnt a lot in R Programming. I have submitted all the codes for the above mentioned book within days. And after completing the TBC, I started working for task B. The Task B for R Programming Language FOSSEE Summer Fellowship (FSF) 2019 was to collect data for 23 variables related to a particular district and then to perform meaningful analysis on the data. This task was as interesting as it sounds because it requires communicating with top government officials. This task may involve long waiting time for meeting Govt officials, long bus travels or going back and forth between government departments, but in the end it turns out to be most educating, fulfilling, adventure rich real life learning experience. The whole process is very easy to follow. First of all, I downloaded and printed the reference letter provided on the https://r.fossee.in/. Then I went to Jaipur District Collector's office in Collectorate, Jaipur. Showed the letter to Collector's PA and requested a meeting with Collector. PA responded very cooperatively and fixed the meeting with the earliest possible time slot. In the meeting, I explained why I have come to him and showed him the letter for reference. He understood me completely and directed me to District Magistrate as District Magistrate takes care of the data related matter. Then I went to District Magistrate and he met with me without any delay. He listened to me patiently and gave me an “information request letter” in the name of different department heads according to my need so that I can fetch required data. I took these letters and went to these department heads. All the department heads understood my motive for approaching them and behaved very friendly and provided me all the information I needed and asked for. They also told me other alternatives from where I can get more data. It was a wonderful experience working with top government officials. What is FOSSEE Summer Fellowship? All college (bachelors, masters, PhD, etc.) Students from all streams(engineering, science, arts, commerce etc.) 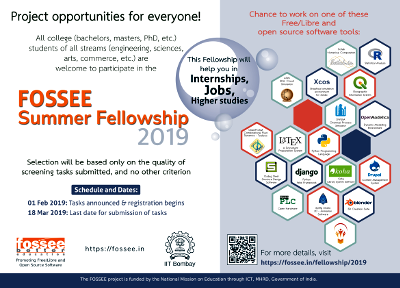 are welcomed to participate in the FOSSEE Summer Fellowship 2019. We request you to share the above fellowship poster with faculty members, students and others who might be interested. You may print the poster (native size - A4) and display on notice boards. The completed tasks will be reviewed by the domain experts in the FOSSEE team. After the review the selected participants will be called for the fellowship at IIT Bombay. If participant selects a task under "Tasks that require submitting a proposal and accepting it" and has completed it, then the participant will be eligible for honorarium and certificate. In case of any queries related to a particular FOSS, please refer the HELP tab given below. Creating functions for various clauses of IS 800:2007 in Python Programming language. Q. What is the procedure of FOSSEE summer fellowship? Q.I came to know about the fellowship what should I do next? A. 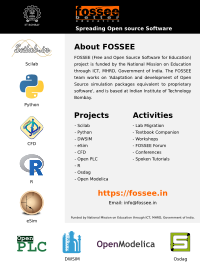 Please go through the website https://fossee.in/fellowship/2019. Register for the fellowship. Before registering please be sure of the topic that you would want to submit your task on. Q. How do I register for the fellowship? A. We recommend you to visit https://fossee.in/fellowship/2019. Before registering, please be sure of the topic that you want to submit the screening task. For registration fill in the registration form: https://courses.fossee.in/login/signup.php. Q. In the registration form, which ID is referred to in the column "ID number"? A. "ID number" refers to the college Id number provided by your college/university. Q.How to I enroll for a course? A. When you fill the sign up form there is a question where you have to select the topic for which you will be submitting the screening task, this is the enrolment. You shall be enrolled for a course during the registration itself. Q. After registration, I am getting a message “You cannot enroll yourself in this course"
It takes some time to enroll you in a course after registration. Please wait for 30 minutes after you register and then access your enrolled course. Q.Can I submit the task in a group? A. No, we shall accept only individual submissions. Q. Can I contact FOSSEE if I have a doubt while working on the task ? A.Yes, you can write to us at info[at]fossee[dot]in or you can use the email ids given in the “Help” tab on the Fellowship website. We shall be happy to help. Q. How do I contact the district collector ? A. Please go to the district collector’s office after taking a copy of the letter present on the Fellowship website. Contact the people there and show the letter, they shall guide you accordingly. Q. Are there any registration fees for the fellowship? A. No, there are no registration charges for FOSSEE Fellowship 2019. Q. Will I get accommodation during the fellowship? A. Yes accommodation will be provided inside the campus on a twin sharing basis to the selected fellows. Q. Do I have to pay anything for the accommodation? A. Yes the selected fellows will have to pay a nominal amount for accommodation along with a refundable security deposit. Q. Will I be provided any remuneration for doing the fellowship? A. Yes you will be provided a stipend depending on the feedback given by your mentors. Q. What will be the duration of the fellowship? A. The fellowship will be for a duration of 6-8 weeks. Q. Will I be provided food during my stay at the campus? A. The students can have their food from the mess inside the campus. The mess charges have to be borne by the fellows. Q. Will I be provided with a certificate? A. Yes certificates will be provided to the candidates who successfully complete our fellowship programme. Q. What documents do I need to bring for the Fellowship? A valid photo ID card/ College ID and a few passport size photographs of yourself. Objection Certificate (NOC) from your HoD that you don’t have any course-work requirements in your parent institution during the period of fellowship (optional). Q. What are the expected working hours? A. Usual working hours of the institute are from 9:15 AM to 6.45 PM (Monday through Saturday). However most technical people work beyond these hours. The interns need to sign in an attendance register daily. Q. Do I need a laptop? A. Yes. You cannot join the Fellowship if you fail to bring your laptop. Moreover, you might be asked by your mentor to install some software, if any, before coming to IIT Bombay. Q. When can I expect to receive the stipend and certificate? A. Issuing of stipend and certificate will take a couple of months after the date of successful completion of the fellowship. Therefore, you are advised to have INR 10k-15k in your hand to manage your living and food expenses during your stay at IIT Bombay. Q. Can we do the fellowship as Work From home basis? A. The fellowship cannot be done on “Work from home” basis. As it will require mentoring and monitoring of the work. It is mandatory for you to come to IIT Bombay for the fellowship. Q. Will I get any travelling allowance from FOSSEE? A. No. The travel expenses should be borne by the fellows. Q. Can I go outside the campus during my stay at IIT Bombay? A. Yes. You can go outside the campus during your stay at IIT Bombay only after the working hours mentioned above. FOSSEE will not be responsible about anything which happens outside the campus. The FOSSEE team encourages you to select and work only on one of the topic/task mentioned in the above table. If you select to work on more than one topic/project the chances for the selection of the fellowship will be decreased. Each task should be taken up by an individual only. We do not encourage group submissions. Honorarium (if any) will be as per FOSSEE norms. Kindly make sure that your submission files do not contain any copyrighted content. FOSSEE team shall evaluate the submissions and declare the final list of selected candidates for fellowship on basis of the completeness, correctness and the quality of the tasks submitted. FOSSEE team reserves the right for the selection and rejection of the FOSSEE fellows. This decision shall be final and non questionable. FOSSEE project in collaboration with the District Collectors are floating some screening tasks where students have to work on problems of interest to the local government, under the FOSSEE Fellowship 2019. A letter was sent to all the 723 District Collectors of India informing about FOSSEE Fellowship 2019.